The time has finally come for Jesus to be made manifest to the earth. The first manifestation was to his parents, the second to the shepherds and now all of humanity. The Magi who came from the East, by tradition are called Caspar, Melchior and Balthasar. It is a Catholic tradition to bless our homes with the following initials made with blessed chalk on this day: 20+C+M+B+19. While the CMB stands for the initials of the Magi, it also stands for Christus Mansionem Benedicat: Christ bless this house. 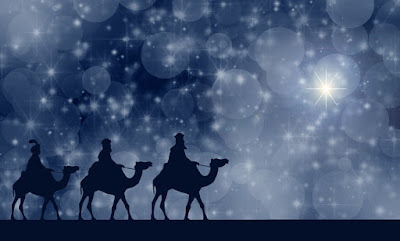 The three gifts they brought were gold frankincense and myrrh. Gold since Jesus is a king, frankincense for his eternal priesthood and myrrh for his death after his passion. By means of the gifts brought by the Magi, the world now is aware that Christ is the King with an eternal priesthood who will sacrifice Himself to reconcile all people to His Father. If we are aware, we are therefore responsible to act properly. This means that by obeying Christ our King, we have chosen to be adopted sons and daughters of His Father who will receive the inheritance promised to us from the beginning. What an unsurpassable Christmas gift!